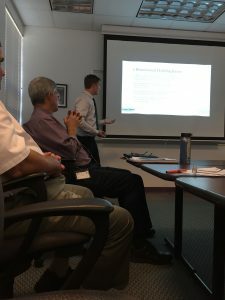 On October 19, 2017, Structural Engineer Jeff DeGraff, PE was invited on behalf of the New Hampshire Department of Transportation’s (NHDOT) of Highway Design to present to the NHDOT’s State Transportation Innovation Council (STIC) regarding the status of the Collaborative Hydraulics: Advancing to the Next Generation of Engineering (CHANGE) Implementation Plan as part of Every Day Counts program through FHWA. As part of his presentation, he explained to the STIC members how the traditional one-dimensional hydraulic modeling computations are limited with regards to bridge design. During this time, he stated that most bridges fail due scour and may be result of an underestimation from one-dimensional design. He also showed the members how two-dimensional hydraulic modeling removed barriers, needs less assumptions, and outputs detailed hydraulic characteristics that can be used for scour analysis and countermeasure design but engineering judgment is still needed. At the end of the presentation, Jeff demonstrated the three-dimensional visualization tools that are used to interpret the results from a two-dimensional model.